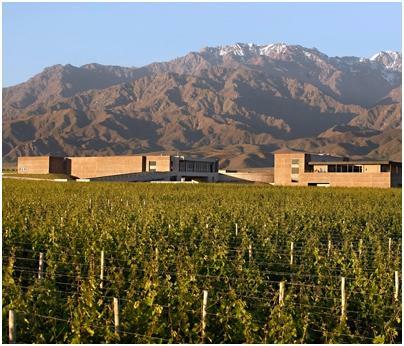 Clos de los Siete, the much-lauded Mendoza red crafted by Michel Rolland, has garnered as much press as any Argentine wine project in recent years. And justifiably so: The flagship wines are both very enjoyable vintage after vintage and--another hallmark of Argentina’s wine industry--exceptionally affordable, especially considering the quality of the fruit; the location of the vineyard sites (in the Uco Valley, south of Mendoza City; it’s gorgeous both aesthetically and viticulturally); and the pedigree of the people involved in the project (their names are a veritable who’s who of the French wine industry: Laurent Dassault of Chateau Dassault, Jean-Guy and Bertrand Cuvelier of Chateau Leoville Poyferré, Rolland himself, and other notables). It’s a fascinating project: 850 hectares (approximately 430 of them are planted right now), divided among seven owners (the siete, or seven, of the name), each of whom is from Bordeaux, and who provide at least 40% of their annual crop to the communal Clos de los Siete bottling. One half of the fruit from each owner’s land must be malbec, and about 60% of the total plantings right now are to that grape variety. The relatively high vine density of 5,500 vines per hectare, a yield of 1kg per vine, a focus on massal selection that prizes higher acidity and lower sugar, the use of a pre-phylloxera malbec clone, and an elevation between 1,000m - 1,200m mean that the fruit harvested from these alluvial soils is as expressive and carefully managed as you’re likely to find anywhere, if not more so. The fact that all of this work goes into a flagship bottling that retails for less than $20 is remarkable. Then again, that’s what Argentina seems to be doing better than almost anyone right now: Providing beautifully expressive wines at prices that are often breathtakingly fair. Below are my reviews of the three vintages of Clos de los Siete that we tasted on-site, as well as wines from four of the seven participants in this project. There’s real power to the plum, black and bing cherry, tobacco and garrigue of the nose here, though it’s balanced out by an unexpected whiff of flowers. The creamy, sweet cherry- and red plum-flecked palate follows through on the promise of that expressive nose, with added hints of chocolate and, with air, a meaty note that anchors it all. Remarkably fresh for a four-year-old wine, and with plenty of life to go. This is an altogether darker-scented wine than the 2006, with leather and clay peeking through the concentrated kirsch, black cherry, coffee, and aromatic plum and wild berry notes. There’s a hint of earth here too, and that follows through to the palate and lends a bass-note of sorts to the sweet fruit and tannins. Beautiful detail and structure here, almost like a particularly ripe Bordeaux style; this promises to evolve for another 10 years, but it’s great right now, too. A sweeter, plummier nose than the 2007, with chocolate, blueberry pie filling, ripe fraises de bois, and roasted bell peppers. There’s an appealing glycerine texture to the palate, a big-hearted structure that supports flavors of summer berries, meat, and roasted fennel. Utterly delicious, with bright acidity, sweet tannins, and plenty of life ahead of it in the cellar. A nose of very ripe fruit, beef carpaccio, crushed blueberries, brown spices, and cafe con leche lead to a velvet-textured malbec with flashes of strawberry compote, crushed red and dark cherries, and cigar humidor. Complex and very tasty. 10+ years. This smells almost Bordeaux-like, its chocolate-coated mint , warm clay, roasted bell pepper, and cigar tobacco reminding me of certain Mouton-Rothschilds I’ve tasted. These aromas turn to a palate of sweet fruit--lots of ripe dark plum--black tea, tobacco, and cocoa powder. The dusty tannins provide amazing structure alongside all this ripeness, and promise 10 - 12 years of evolution. The black color here brings to mind the famous “black wines of Cahors,” those quintessential French malbecs that more people really should drink. There’s a solid sense of density to the nose here, with roasted blackberry, maduro cigar tobacco, and a bit of smokiness. On the palate, these savory tones continue, with asphalt, blackberry, sappy black cherry, leather, and, to provide a lovely sense of lift, violets. In some ways, its density and expressivity remind me of the Spanish giant Numanthia. Wonderful. Spicier, more brambly fruit on the nose, lifted by peppercorn and notes of dried Mediterranean herbs. For all this, however, the palate is remarkably soft and lush, with flavors of sachertorte and raspberry jam that lead to a caramel-like finish. A rich, round style.